Will LLDPE continue to gain relative to LDPE in Asia in 2013? 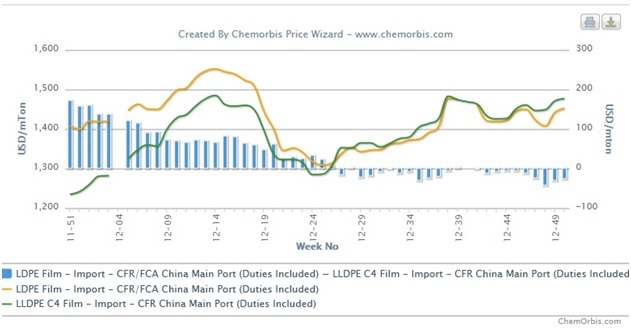 During the course of the past year, LLDPE film prices have posted steady gains relative to LDPE film prices in Asia, with the result that although LLDPE traded at a considerable discount relative to LDPE at the start of the year, LLDPE currently trades at a premium, as per the pricing service of ChemOrbis. Looking ahead to the coming year, a source at a Middle Eastern producer commented that they expect this trend to intensify next year. At the start of December 2011, LDPE film traded with a comfortable premium of around $175/ton over LLDPE film on a CFR China basis after taking any applicable customs duties into account. The premium carried by LDPE film over LLDPE film had dipped below the $100/ton threshold by February 2012 and the two products were trading more or less at par by the start of July. Since then, LLDPE film has traded either at par or with a premium over LDPE film, with the premium for LLDPE film rising to a high of slightly more than $40/ton at the start of December. A major Middle Eastern producer announced its January prices for both LDPE film and LLDPE film to China and Southeast Asia this week. The producer’s January offers for LLDPE film carry a premium of $5/ton over its LDPE film prices to China while its LLDPE film prices to Southeast Asia carry a larger premium of $10-20/ton. A producer source commented that they believe that LLDPE film will continue to gain strength relative to LDPE film in the coming year. “LLDPE film prices have gained a premium over LDPE film prices in contradiction to the previously established trend and we believe that LLDPE film will remain strong relative to LDPE film next year,” the source told ChemOrbis. “We think that LLDPE film will gain a larger share of the overall PE market in 2013 and that comparatively tight supply for LLDPE film will keep prices firm. On the other hand, we believe that LDPE film prices will be weighed down as there are some new capacities coming on-line and Iran will continue to supply a large amount of LDPE to major global markets. Therefore, we do not believe that LDPE film prices will see any significant increases next year,” the source added. Two Middle Eastern producers brought new LDPE capacities on-line towards the end of 2012 and another Middle Eastern producer is set to open a new LDPE capacity in the first quarter of 2013, with the producers in question adding a total LDPE capacity of around 800,000 tons/year. Qapco officially inaugurated commercial operations at its new 300,000 tons/year LDPE unit in Qatar on November 19 while Saudi Kayan started test runs at a new 300,000 tons/year LDPE plant in Saudi Arabia in October 2012. Saudi Arabia’s Saudi International Petrochemical Company (Sipchem) plans to start up a new 200,000 tons/year LDPE plant in the first quarter of 2013.